Easily one of the most common questions I (and the forums) get asked is what is the best espresso equipment setup for $1,500. The $1,500 price point seems to be a common target for many diving full in for the first setup or those looking to upgrade from more entry level equipment. This price point is interesting because a few concessions typically need to be made, but depending on your priorities, there are some great options. I tend to think the grinder and machine solicit a different set of questions and qualifications, so I will list my picks for each separately. Some of these combinations may come in above or below that price point, allowing you to tailor the options to your budget. I always say the grinder is most important, so let’s start there. The grinder also tends to be the trickiest component at this price point since by in large, there tend to be big gaps in the grinder market. You have entry level options between $400-700, then from there until nearly $2,000 are grinders that may be of similar performance in grind quality, just with more robust, commercial build quality and features. The unfortunate truth is there is a high barrier to entry with espresso, and spending more does typically make it easier due to more consistency and better control. These options each have their strengths and weaknesses that I outline. The Sette 270 is a grinder that really shook up the market when it was first introduced. With some stating the grind performance was on nearly on par with the full commercial Compak K10 PB, with faster grinding, and single dosing capabilities right out of the box. Its weak point has been reliability and performance. It has gone through some teething pains, but I will say that Baratza will not leave you hanging and is very supportive of their products. I typically recommend foregoing the weight versions of the grinder, the 270Wi, since you’ll need a scale anyways, and dosing will generally be +/- .3g or so, but there is the option. Weaknesses: Longevity and reliability concerns, very loud. The Vario has a bit more longevity on its side, though it has gone through teething pains of its own over the years. It is a reliable timed or single dosed grinder that will work just fine for nearly all espresso blends and most single origin coffees. Where it struggles is in fine tuning with the more difficult or lightly roasted single origins and some grind consistency that really stands out when dealing with those sometimes stubborn coffees. I’ve had one since early 2013 and have used it for single dosing for espresso through coarse cold brewing. I have since swapped out the standard ceramic burrs in lieu of the steel brew burrs, and it’s now a very competent brew grinder, as reviewed here. Strengths: More proven longevity, timed or single dosing, can be swapped for brew burrs, quieter than the Sette 270, and pretty capable. Weaknesses: Inability to switch back and forth between brew and espresso settings, struggles at fine tuning more demanding coffees, particle distribution can impact this. Some say the Sette 270 out performs the Vario in the cup. Image courtesy of Niche Zero’s website, click through for more info and ordering. If you read back through all of my posts, like this one, I have been wanting something just like this for years now. The Niche Zero brings a grinder that was intentionally designed and built for single dosing with performance (arguably/presumed) above the entry level Baratza options, in a home friendly package, for under $1,000. The 63 mm conical burr set, direct grinds path, and noise conscious design that will fit under your kitchen cabinets really bring the single dosing home barista everything they have been asking for years. What’s the catch? Just that it’s new and still being proven is all, and the early feedback is really quite promising. The only real debate currently is the most effective way to get even distribution into the filter basket with some grinding directly into the portafilter with the help of a funnel and WDT, and some grinding in the catch cup and then transferring grounds. I have yet to get my hands on one, but provided it can be single dosed into the portafilter, even if it requires a funnel and WDT, this grinder is very promising. Strengths: Very home friendly in size and noise levels, early feedback backs performance specs, large conical burr set and designed to be single dosed. Excellent price in the market. Weaknesses: Still very new with a waiting list when ordered through a UK based crowd sourcing/startup page, some find the appearance polarizing, no portafilter holder means you have to find a solution yourself if you wish to grind directly into a portafilter. Early reports sound as though it will require WDT and/or redistribution when grinding directly into the portafilter. Price: 499GBP or about $635 + shipping on indiegogo here. There are a handful of other grinders, particularly around the $1,000 mark that I have mentioned in the other posts including the Lyn Weber Workshops HG-1, Anfim Cody II, Compak E5, Eureka Mignon Specialita, and Ceado E37J, but, with the exception of the hand cranked HG-1, those don’t necessarily outperform these listed in grind quality. They tend to be more robust, better built, and with more stable grind adjustments, but for the purpose of the price point of this post, I’m going to omit them. Certainly they are good grinders, and if you get them used or on sale, you should be in a pretty good spot. This is the first time the Breville Dual Boiler (BDB) is making the list on the site, and I do feel like it’s a bit overdue. The BDB is an interesting proposition: it packs a ton of features and performance for the price, is a very counter friendly footprint, and can typically be picked up for even less money with a good coupon from one of the big box stores that sells consumer grade kitchen gadgets and appliances. The fact that it is considered to be a consumer kitchen appliance is the catch though; there’s a lot of plastic, albeit high grade, and it’s not really designed to last a lifetime and be repaired. So, when the early BES900XL units were launched with some early teething issues, it was tough to recommend a machine that had an expected life span of 2-5 years. However, a lot of those bugs have been worked out, and since they’ve been in circulation for awhile now, there are plenty of guides for modifications and common part failure replacements and upgrades. The BDB comes in brushed stainless steel, black, and cranberry red. You simply cannot find another dual boiler (or even many single boilers) features like this: PID temperature control, shot timer, preinfusion control, adjustable OPV, programmable timer so it can be programmed to start preheating before you’re out of bed, and it’s even available in various colors. The machine comes with a 2-year warranty, that Breville is said to be extremely good about honoring, plus any additional store warranties that may come from the various retailers. That, and you can routinely buy these for 20% off or more with department store coupons, Amazon credits, etc. Strengths: Great performance for the price, home friendly size, dual PID’s, programmable, color options, cannot touch a dual boiler machine at this level for the price. Weaknesses: Plastic housing, Breville specific portafilters, parts aren’t as readily available, machine isn’t intended to be user repaired (though many common repairs can be completed now). Price: $1,189.90 on Amazon here. The Mara is a great option from a reputable company packed in a small package. A true E-61 grouphead and commercial 58 mm portafilters make this a reliable and classic machine in performance and appearance. The footprint is kept deliberately small to fit in the tiniest of kitchens, and it’s one of the least expensive points of entry to the E61 HX game period. Strengths: Solid performer, true E61 grouphead and 58mm portafilters, two stage low water shutoff allows you to finish a shot when the low water level is reached. Weaknesses: Small footprint can make for cramped workflow, small-ish 1.4L boiler. Price: $1,099 from 1st Line Equipment here. Quick Mill Silvano Evo - $1,075 - An excellent entry level or low volume machine with single boiler and thermoblock for steaming. Crossland CC1 V. 2.0 - $699 - Very similar in specs and performance to the Silvano Evo with just a bit less polished steel and a touch more plastic. A proven and solid performer at the top of the single boiler range. Any combination of these machines and grinders makes for a very solid and capable setup. The only drawbacks from the machine side would potentially be in form of fit and finish, features, steaming performance, and recovery time / volume constraints since they simply won’t be temp stable enough and/or recover fast enough to crank out drink after drink for a large volume, especially milk drinks. The morning routine of a few drinks back to back is right in the sweet spot of these machines. For the grinders, a lot depends on if you want to single dose or not, and what kind of coffees you will be using. If medium roasts and blends are the the preferred, the Baratza options will suit you just fine. If you’re looking for more flavor clarity and separation, the Sette may cut it, and the lightest roasts will demand something very stable and more robust to remain consistent. Here, the list of the higher priced grinders with similar sized burs may be the better option since they will remain more stable and offer true stepless grind adjustment. If you like to single dose, the Niche Zero is the wildcard as it appears to provide both great grind quality and stable operation. 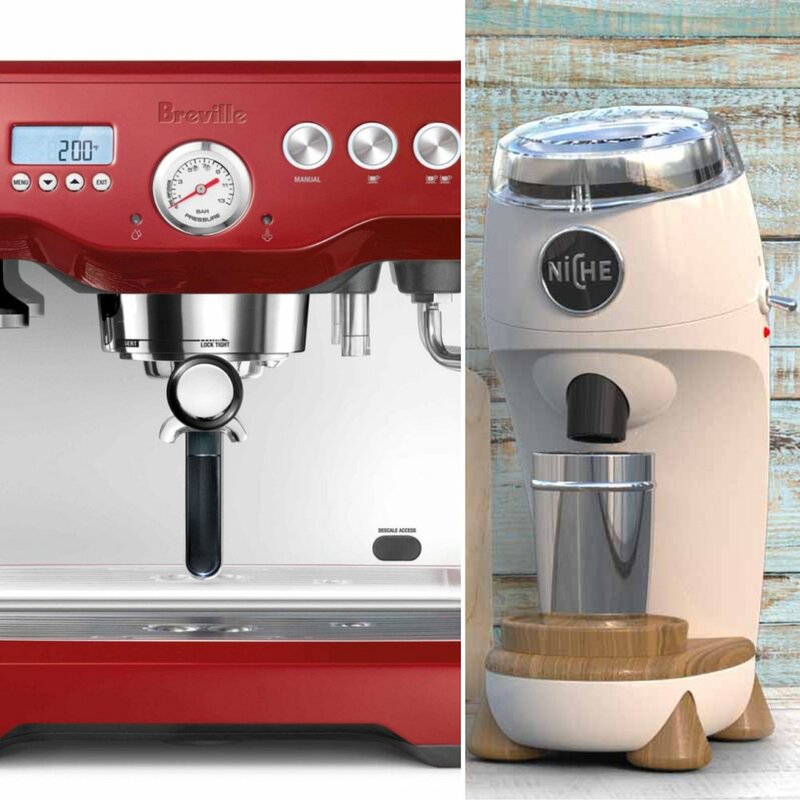 For my money today, I think I would chose Niche Zero with the Breville Dual Boiler or Lelit Mara. I absolutely prefer single dose grinding in the home for a myriad of reasons, and the Niche Zero, by all early accounts, gets very close to top of class single dosing grinders at less than half the price. The machine option is a little more difficult, for me, since on one hand you simply cannot get a machine with as many features or as much control as the BDB for the money. On the other, I really like things to feel solid and robust, and do I worry that the BDB might feel to plastic-y day in and day out, though perhaps you’d get used to it. With resources and information on the BDB now much more readily available on the forums, I think I have to get the edge to the Breville Dual Boiler though.